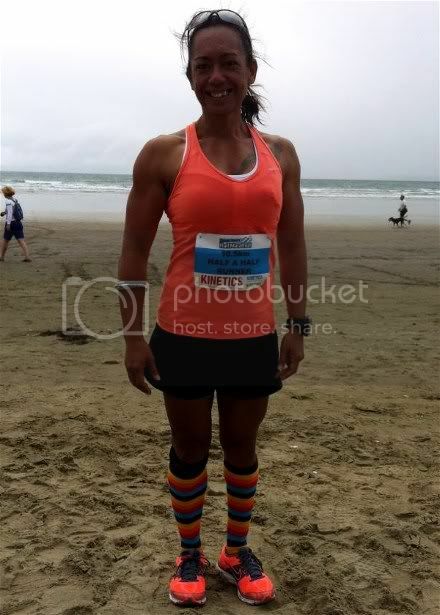 The organisers of the Orewa Half Marathon had offered super cheap entries at the start of the year on one of the numerous voucher a day sites and so I nabbed a half marathon entry for J and a 10.5k entry for myself. This was originally going to be my first 10k run but because I opened my big mouth during the Albany Run Series earlier in the year I ventured up from 5k runs to 10k runs earlier than originally anticipated so this ended up being my 5th race with a distance greater than 5k’s. I’m not sure if the fact it was a “budget event” or because they ran the voucher offer a few times over the months preceding the event but whatever it was the field was HUGE! 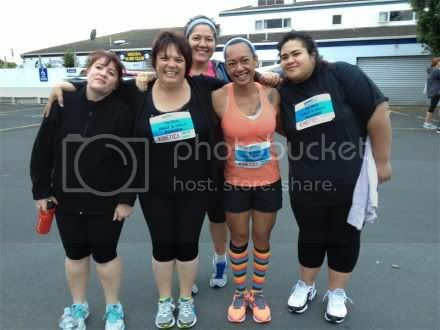 Margaret and the girls from the Big Boys & Girls club trained by Frank Stowers at Genetics Gym in Manukau. These women have already lost 40+ kilos! 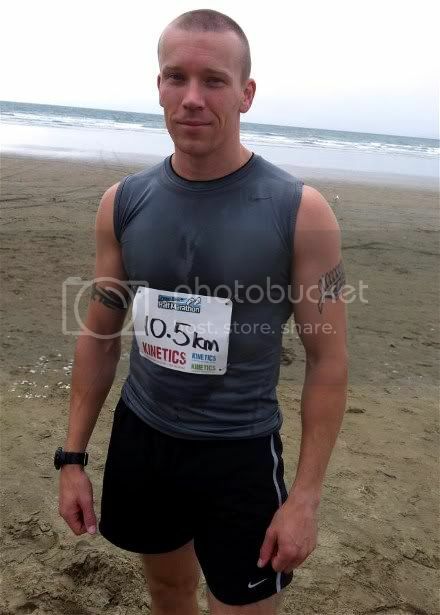 The first few k’s of the event were a run down the beach so J and I went down to the start area where we found that the wind was blowing a gale. 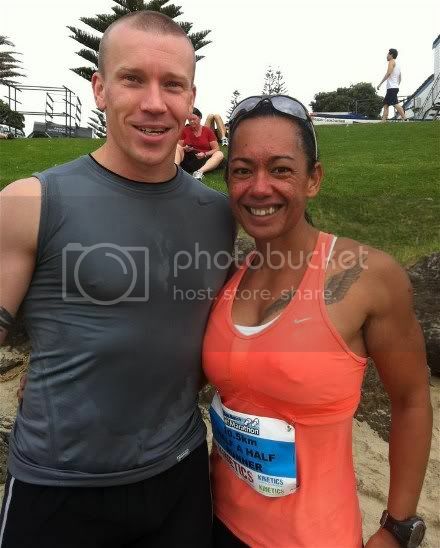 It was at that stage that J decided he didn’t want to run the half and would instead trade down and run the 10.5 with me which I actually thought would mean he would just run the 10.5 and that he would wait for me at the finish line like he usually does – but no .. he actually meant he would run with me. For those of you who don’t know (or can’t tell from the pics) J is 6 foot tall and I am 5 foot 3 (ish) so his legs are considerably longer. Add to that he is a “runner” and I mean a real runner not someone who has just taken up running like me and that tells you he is considerably faster than I am. I told him I wanted to run at a slower pace than my normal so that my knee would last the distance and I stated a pace of 6:20-6:30 per kilometer. James obviously didn’t hear me or decided that I was joking because we were running at a 5:50 for the first few ks and he kept trying to get me to catch people or run faster at about 6’ks I yelled at him using the F word and slowed down. (I apologised a k later). Because of Super J with the long legs pacing the last three k’s along the beach were excruciating with about 1k to go I honestly thought I was going to burst into tears. Instead I stopped for a few seconds took a few deep breaths stretched out my knee and kept going. I’m harder than I look. I know you are all thinking, so whats the problem you ran the race in the time that you wanted. Well the thing was if I had plodded one speed for the entire race I would have done it pain free and enjoyed it instead of running too fast for the first half then slowing down to a snails pace at the end and close to tears .. you live and learn I guess. I still managed a smile at the end though and there was one part of the run I actually really enjoyed (actually two if you count the finish). I loved running through the bush and even on the way back when my quads and knee were screaming at me to stop the bush run felt surprisingly easy. I may change my mind about doing some of the Xterra Series races .. we will see.